Diabetes is a disorder that contributes to arterial and nerve damage, foot ulcers, lower limb pain and numbness, weakness in hands and feet, kidney disease, vision problems, heart attacks, stroke, and poor circulation. It is a scourge of pain, suffering, and premature death globally that kills an estimated 5.1 million people a year − a tragic statistic sharply on the rise. A healthy diet, regular physical activity and maintaining a normal body weight are widely promoted to prevent or delay type 2 diabetes, the most common form of the condition (90 percent of cases) and one of the world’s fastest-growing diseases. I strongly believe there’s an overlooked element here and also in the alarming rise of other chronic illnesses over the last half-century: the increasing human disconnect from the Earth’s natural, negative electric surface charge. The planet’s surface charge comes from the virtually limitless and continuously renewed reservoir of free electrons, the presence of which has been well-established by science. Maintaining contact with the ground allows your body to naturally receive and become charged with these electrons. When thus “grounded,” you automatically absorb these free electrons which in turn quickly reduces electrical imbalances in the body and the oxidative free radicals involved in chronic inflammation and multiple diseases. Throughout history, humans mostly walked barefoot or used semi-conductive animal hides for footwear and bedding. We lived in contact with the Earth at all times. Not anymore. Today, we mostly live and work above the ground (often very high above the ground in high rises!) and wear non-conductive shoes with synthetic soles made of plastic and rubber compounds. We rarely go barefoot outside. We are disconnected! Consequently, our bodies have become Earth-starved, and likely become electron deficient, a state that leaves us more vulnerable to inflammation and inflammatory diseases, diabetes among them. The question arises, as the chart below poses graphically, as to whether this observation is a correlation or a coincidence. Is the loss of our planetary electrical roots a factor in the rise of diabetes and other inflammatory diseases that parallels the proliferation of sedentary living and overconsumption of calorie-rich, nutrient-poor food loaded with sugar and high fructose corn syrup (HFC) sweeteners? 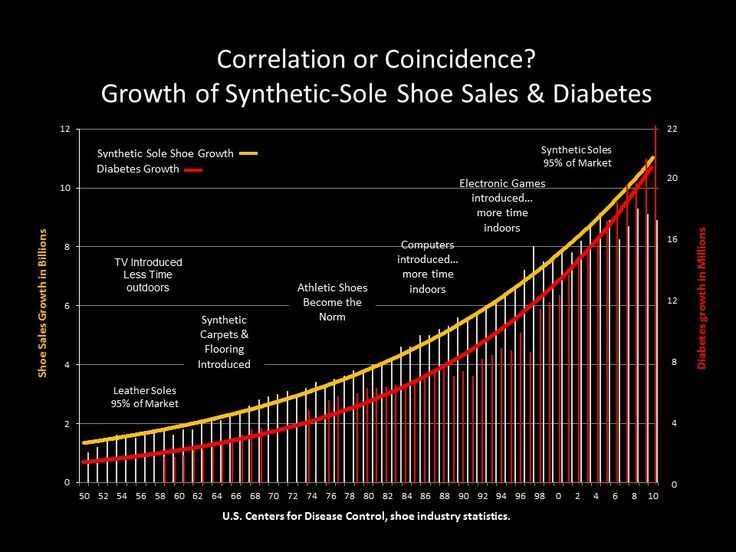 The chart shows a similar curve growth in the incidence of type 2 diabetes and sales of synthetic-sole shoes in the U.S. since the 1950s. At that time, 95 percent of shoes were made with leather soles, many of which were conductive. Currently, 95 percent of shoes have synthetic, non-conductive soles. Can Earthing (grounding) benefit diabetes by reconnecting you to Mother Earth? Yes, and here are some of the systemic effects of Earthing that make it happen. Diabetes involves the body’s ineffective use of insulin, the pancreatic hormone that regulates blood sugar. One main component of diabetes is an inflammatory scenario where excess fatty tissue in the abdomen produces inflammatory chemicals that suppress the actions of insulin. The body becomes less sensitive, that is, more resistant, to insulin. This in turn produces more inflammatory chemicals and interference. Blood sugar rises. Add obesity and stress to the mix, and you further increase the level of inflammatory chemicals. The influx of electrons from Earthing into the body reduces chronic inflammation. Earthing research and subjective experiences from around the world suggest clearly that this very same electronic charge of the planet’s surface plays a governing and nurturing role for both the animal and plant kingdoms. Think of it as “electrical nutrition,” with the potential to restore, normalize, and stabilize the internal bioelectrical environment of the human body’s countless electrical systems that govern the functions of organs, tissues, cells, and biological rhythms. Earthing helps defuse stress by promoting a parasympathetic, calming mode in the autonomic nervous system (ANS) that regulates functions such as heart and respiration rates, and digestion. The effect rapidly shifts the ANS from a typically overactive sympathetic mode associated with stress. A study I conducted with electrophysiologist Gaétan Chevalier demonstrated how Earthing improves an important indicator of balanced ANS, called heart rate variability. HRV, as it is called for short, refers to the very subtle variations in heartbeat intervals. ANS and HRV are commonly disturbed by stress and represent an increased risk for cardiovascular problems like arrhythmias and sudden cardiac death. Moreover, abnormalities in HRV are regarded as early evidence of cardiovascular autonomic neuropathy, a widely overlooked complication of diabetes that damages nerve fibers supplying the heart and blood vessels. Such abnormalities disturb heart rate control and vascular dynamics. Earthing helps control the blood glucose level. Polish Cardiologist Karol Sokal, and his neurosurgeon son Pawel have been actively researching and documenting the various effects of grounding on the physiology for more than two decades. They have made clinical observations on many hundreds of people with different conditions, including diabetes. They have reported “good things” with diabetes, and documented their findings in a 2011 study. “We have been able to withdraw insulin for some people because they achieved a reduction in their blood sugar just from walking barefoot,” the Sokals reported. “We found that in some cases the combination of medication and grounding could even push the glucose level too low. “Imagine telling someone that if you go barefoot you may be able to reduce or withdraw your insulin…or some other medication! Yet that is what we found. It all depends on the level of glucose as to whether and when you can cut out the medication or reduce it. With oral medication, we observed that some people with diabetes could walk barefoot and not need anti-diabetic drugs like Metformin. Earthing has a powerful impact on circulation. You can frequently see people’s skin turning pink, from improved blood flow, soon after they become grounded. It’s almost as if you have opened the flood gates of a dam. The key mechanism here appears to be zeta potential, a term referring to the effect of the electrical charge on the surface of red blood cells, a built-in feature that enables the cells to repel each other and prevent unwanted clumping and clotting. The more negative the charge the greater the zeta potential – the ability of the cells to repel each other, and the better the flow. I often used the analogy with my patients about wanting to see their blood thin, to flow like red wine, and not be thick, sludgy, and viscous like ketchup. Heart patients and diabetics have thick blood. Earthing’s zeta potential effect on blood was demonstrated in a 2013 pilot study in which I participated. In the study, we grounded ten healthy subjects for two hours, took blood samples before and after, and measured the negative charge on the red blood cells of each sample. The results indicated a nearly three-fold increase, on average, of the zeta potential, with significant improvements in the electrodynamics, blood cell movement, and aggregation of the red blood cells. Seen through a microscope, we clearly observed less clumping of the cells and better blood flow. Here’s a video clip of that effect. The findings from this small study are exciting, and help us understand the mechanisms of how grounding individuals with diabetes, cardiovascular disease, or any other viscosity-inflammation related condition, has the potential to generate very significant improvements. Diabetic patients have described to me better circulation in their extremities. This is extremely significant because so many diabetics suffer with poor circulation and neuropathy (nerve damage) in the legs and feet. In my ongoing research, I came across a fascinating 2008 study in the international journal Biochimica et Biophysica Acta that reported, for the first time, on the zeta potential of red blood cells in diabetics. The Indian researchers, from the University of Calcutta, described “a remarkable alteration” in the electrodynamics of red blood cells, and specifically a progressive deterioration of the zeta potential among diabetics and, at the worst, among diabetics with cardiovascular disease. Their research revealed a parallel between poorer zeta potential and hypercoagulability, a term meaning an increased risk for dangerous blood clots to form in the arteries and veins. “Blood becomes sludge so that it becomes increasingly difficult for the heart to pump, and the system becomes less efficient to perform the usual functions affecting macro and microcirculation,” they said. They concluded that zeta potential should be used as an indicator of cardiovascular disease in individuals with diabetes. A few years earlier, this same group of Indian researchers had reported that high blood sugar causes oxidative damage to red blood cells and hemoglobin. Hemoglobin is a protein molecule in the blood cells that carries oxygen from the lungs to the body’s tissues and then carries out carbon dioxide. In their 2008 study, the Indians reported that the high blood sugar also significantly alters the electrodynamics of the cells’ outer membrane, thus increasing the potential for clumping.